For years, Zowie esports mice have dominated the professional CS:GO scene with a variety of gaming peripherals, being lauded mostly for their mice and their super comfortable and amazing to use shapes. At the very top, the Zowie EC2-A has made a name for itself as the most used CS:GO gaming mouse, being the top choice of CS:GO professionals for quite some time now. A mouse that’s so universally loved among professional players has to be something really special, so we sent a copy over to one of our reviewers to find out just how good it is, and if it still holds up in today’s market. Spoiler alert: it’s really good. 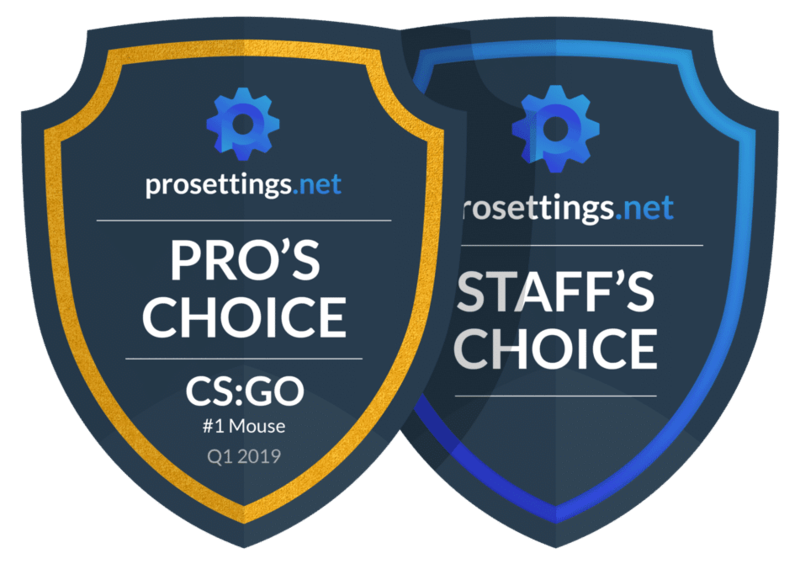 There is no better choice for our first gaming mouse review on ProSettings.net. 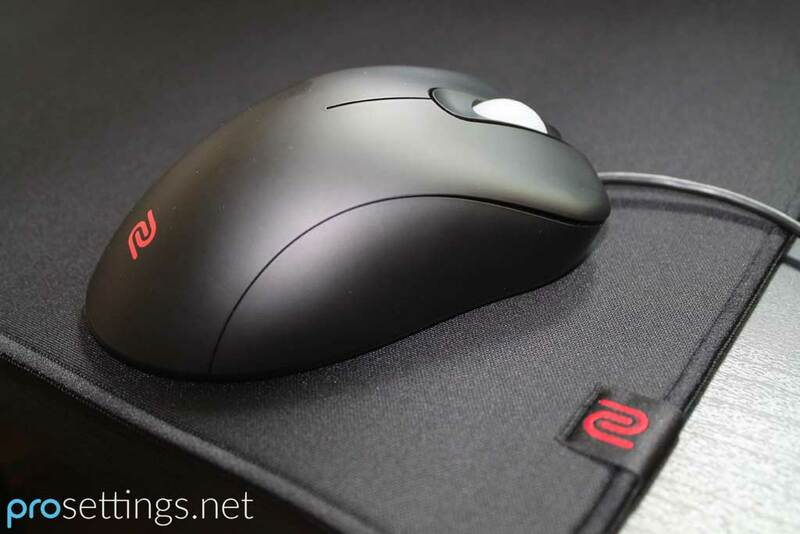 Read our full Zowie EC2-A review to find out why. 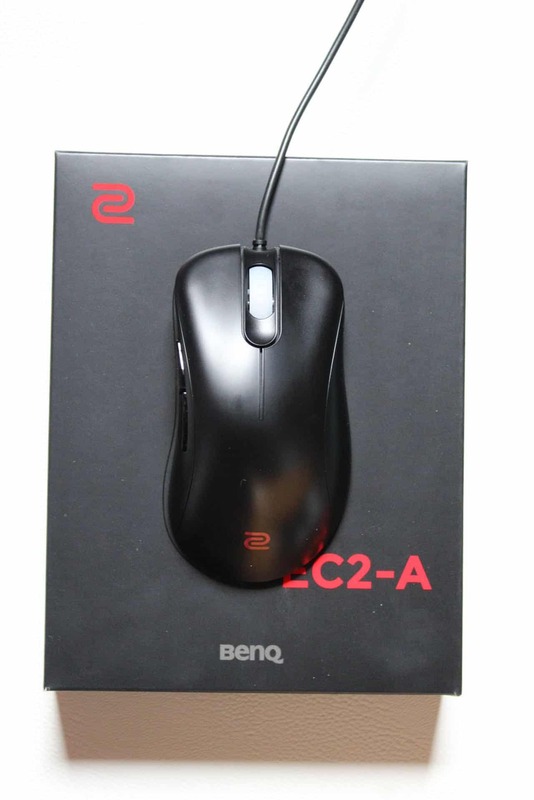 The first thing you notice about the EC2-A (like with all Zowie mice) is that it sports a particularly discrete design. It doesn’t have aggressive logos or wild patterns on the mouse and the only ‘gamer’ aspect on the mouse is the fact that the scroll wheel lights up. Make no mistake. This mouse is designed for esports. The mouse is finished with a small Zowie logo towards the back and an even smaller BenQ logo (which is barely visible) on the left side of the mouse. You definitely won’t attract a lot of moths when you use this mouse in the dark, but that is part of Zowie’s design philosophy. One of the most important considerations when deciding on a mouse is the mouse size and weight. 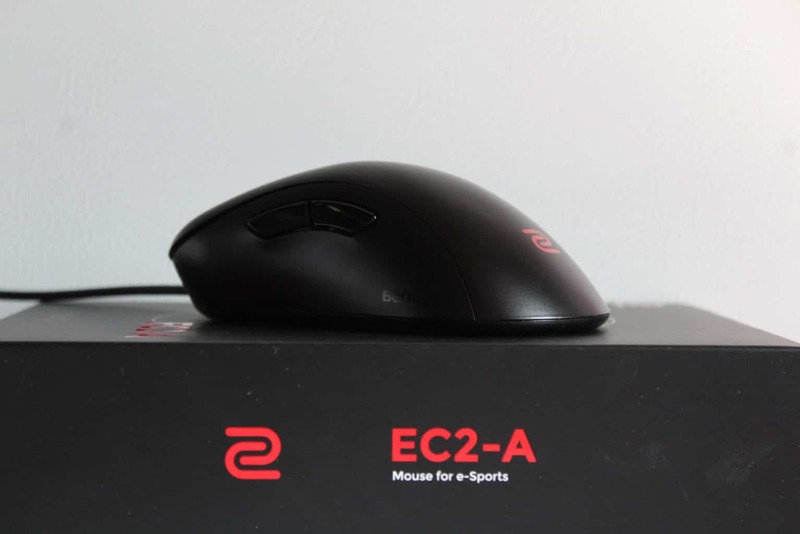 The EC2-A is considered “medium size” in Zowie’s size categories, and also falls into the middle of the pack when compared with other esports mice. Weighing in at roughly 90 grams (3.2 ounces) it is one of the lighter esports mice, without sacrificing design shape and size. The packaging is the least important aspect of a gaming mouse, but I thought I’d mention it anyway because there’s a nice surprise in there. When you open the sleekly designed box you are greeted with the mouse, the usual user manual stuff, a sticker, and two spare mouse feet. The inclusion of spare mouse feet is a particularly nice touch that most other mouse companies do not include, so bonus points to Zowie for that one. One of the first things people talk about when they hear the name Zowie is the fact that their mice are just so damn comfortable, and I have to say that this reputation is in no way an undeserved one. Every little curve and bump on the mouse seems to have been carefully designed and tweaked throughout many iterations until they managed to come up with the perfect feeling. Obviously there are many mice out there which feel comfortable, but there’s just something about the EC series which sets it apart from the others. It’s something you have to feel for yourself, and since the shape of the mouse is a pretty ‘safe’ (there’s no large humps anywhere and the mouse doesn’t ‘force you’ to hold it in a certain way) one I feel like most gamers looking for an ergonomic rodent will agree with me on this one. 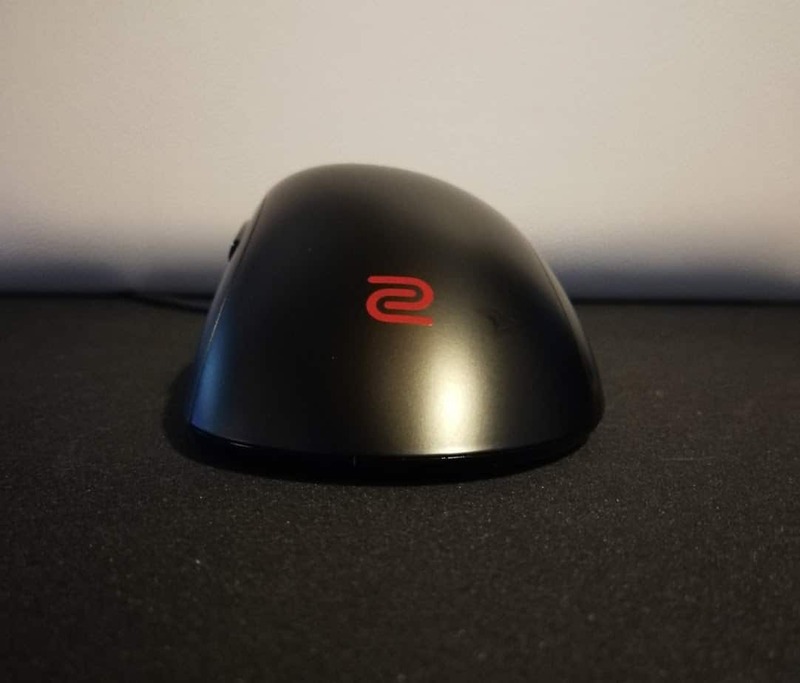 This is easily one of the best shapes I’ve ever had the pleasure of holding and this is immediately something which sets Zowie apart from its competitors; when it comes to shape there’s no brand quite like Zowie. The only minor downside I could find is that if you want to change your DPI (the color of the scroll wheel indicates what DPI setting the mouse is on) you’ll have to reach underneath the mouse, since the button for that is located on the bottom. This however is a strong consideration for competitive gamers. If the DPI button was located on the top there is a possibility that a misclick would change your DPI. The Zowie EC2-A is finished with a non-glossy plastic throughout, so no rubber grips anywhere or textured elements that can get sticky. The EC2-A features two rather large mouse feet located on either end of the mouse. These provide a very smooth and controlled glide. The Zowie EC2-A has a pretty heavy, though crisp clicking experience. Both clicks sound and feel the same, so no issues there. I’m not personally a fan of super light clicks so for me the clicks on the EC2-A are real winners. I didn’t find myself accidentally clicking a button or accidentally double clicking and the buttons have a pleasant tactile feel to them. The side buttons are located very conveniently (they do not get in the way whatsoever during gameplay) but it has to be said that they do have quite a bit of travel time and feel a bit mushy. When you press them you kind of go ‘in’ the shell of the mouse so I’d have liked to see a bit less travel time here. The scroll wheel is rather loud (at least in comparison to some other gaming mice out there) but it does have pretty satisfying and easy to feel steps to it and it’s easy enough to press. The mouse wheel is designed that way to make it easier to use for gaming related actions, so people who select their weapons (or spells or what have you) with scroll will not accidentally skip past a weapon, for example. I rather liked the scroll, but being that it’s pretty different from most other mice not everyone will immediately fall in love with this one. There is no sensor rattle, nor is there anything moving or rattling when I’m moving the mouse or doing quick flicks. I also slammed it down on the desk a few times (gotta know if it stands up to raging gamers) and it handled that just fine without anything coming loose or making a sound. I obviously haven’t been using it for years so I can’t comment on durability, but from what I can tell the mouse has a really solid build quality. I hate it when you can hear (or even worse: feel) a bunch of stuff moving around in a mouse when you’re out there doing quick flicks and what have you, so the fact that the EC2-A remained perfectly silent throughout my review process is a huge plus for me. The thin rubber cable is 2 meters (6.6 feet) long, and I love it. It’s very lightweight and flexible and it doesn’t seem to get in the way at all, even if I don’t pop it in my mouse bungee. I’m not a fan of bulky or braided cables (though I don’t imagine that any competitive FPS players is a fan of bulky cables) so Zowie keeps building on their ‘it just feels so good’ reputation by opting for this type of cable. I put the Avago 3310 through its paces (which means I scientifically tested it in Paint, Aim Hero and CS:GO) and it performed perfectly. It didn’t spin out on me once and tracked every target with pixel perfect precision. There’s no angle snapping or any other nonsense (which would be a cardinal sin for a gaming mouse). We consider the Avago 3310 a flawless sensor. The 3310 might be a slightly older sensor by now, but it’s still very, very capable. I and many other gamers and reviewers have never encountered any issues with the 3310 so if you are liking the sounds of a mouse with a 3310 I’d strongly encourage you to try it out. Key points of concern for grip type are often described in relation to hand size and comfort. Not unlike choosing the perfect shoe, a grip will tend to follow your playstyle and different scenarios you come across when playing. The EC2-A is shaped in a way which will benefit all sorts of grip styles, in my opinion. 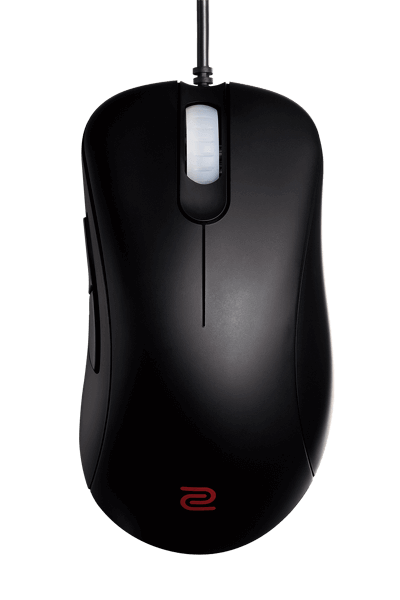 Zowie mice are specifically designed for flexible use, with shape and ergonomic use being key focus points. The EC2-A is definitely a prime example of that design philosophy. The combination of shape, coating, and weight distribution all culminate in a mouse that is incredibly pleasant to use, both for gaming and office purposes. 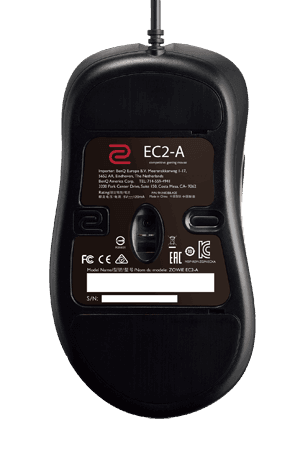 Most larger ergonomic mice feel a bit ‘bulkier’ when quickly swiping or doing fast movements, but the EC2-A doesn’t suffer from that at all. The mouse has virtually no break in time and doesn’t need a lot of time to get used to its shape. It was an absolute pleasure all throughout my time with it. When you’re gaming and you kind of forget that you’re holding a mouse you know you’ve got a good one, and that is absolutely the case with the Zowie EC2-A. In order to use the mouse you just have to plug it in, and that’s it. No need to mess around with software or make an account or any of those shenanigans. That’s also part of Zowie’s ‘let’s cut the talk and walk the walk’ philosophy: just plug in, set your DPI (you can choose between 400, 800, 1600, and 3200) and get to fragging. This does mean that you can’t reprogram what the buttons on the mouse do and you also can’t choose which color the scroll wheel will be (as that is dependant on the DPI setting that you’ve chosen) but to me that is no problem at all. The shape is so nicely done that I had no issues picking up the mouse whatsoever, even after a prolonged gaming session. The mouse is also very nicely balanced. It’s not top or bottom heavy, which is a definite plus. When it gets tense in games (and when doesn’t it get tense in competitive FPS games?) my hands tend to become rather sweaty which can cause problems with certain mouse coatings, but even after a few hours of gaming I had no problems with the EC2-A. The shape is definitely the standout factor, but the mouse itself tracked my every movement with perfection and I didn’t have it fail on me once. When I’m testing mice I like to put them through a couple of rounds of aim maps because it gives me the ability to judge the tracking of the mouse as well as the comfort, since they can be pretty ‘hard on the hands’ due to the fast paced aiming you need to pull off. The EC2-A definitely aced those tests and I had no issues with it whatsoever. The hype around this mouse has been insane in certain parts of the gaming community, and that, to me, is entirely justified. I’m usually pretty keen on finding flaws in hyped up products or shows (yes, I’m that kinda guy) but I can say with full confidence that this is one of the best mice I’ve ever had the pleasure of using. The shape of the EC2-A is the best that I’ve ever had, the sensor didn’t trip up once, the clicks feel satisfying and consistent, … The mouse fit perfectly for my style of grip, but I am pretty confident that all grip styles will work with this mouse (depending on the size of your hands) because of its pretty safe shape. It’s not all perfect though; the side buttons can sometimes feel a bit mushy and cheap. The scroll wheel is also pretty loud and feels ‘just okay,’ though having an okay scroll wheel is by no means a downside. In summary, if you are looking for a top tier gaming mouse the Zowie EC2-A definitely deserves a spot on the top of your list with its absolutely amazing shape, light weight, precise buttons and top tier performance. Please let us know what you think in the comments below. Cheers. I Have 21×10cm hands ,i use Claw and Hybird Grip . Should i Get Zowie Fk1 or Zowie Ec2-a or Zowie Ec1-a ? BTW i like Medium-Large mice than ultra huge mice but i don’t know what shape and Dimensions would be better for me. You can contact me on my email or on this comment but please reply because i’am realy confused. I use medium senstivity between 2.2 and 2.5 still didnt find my best sens but just sating if it will mind choosing the best mouse. Although you have only reviewed 2 mice (FK1 and EC2) Expecting for more reviews soon ! Is EC2-A the way to go for me? I am searching two weeks already for a best gaming mouse that fits my hand grip, length etc. 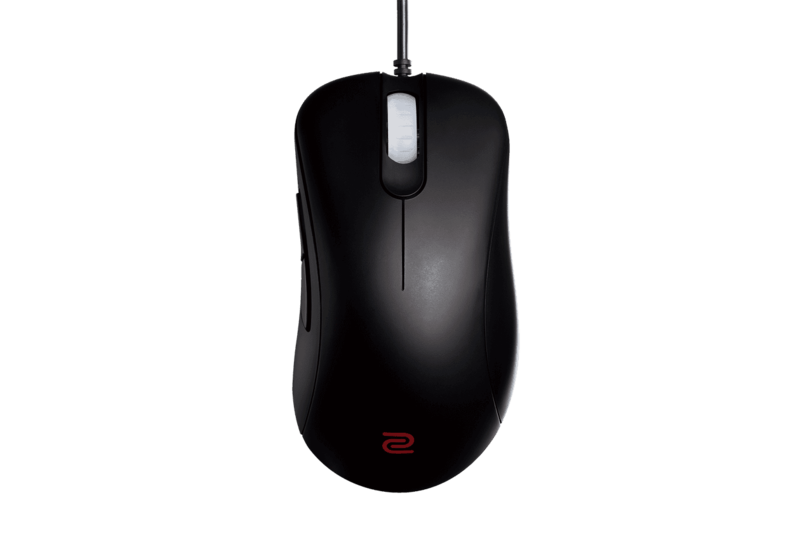 So basically I am a FPS gamer (CS GO) and Zowie mices are rated most comfortable and best fps gaming mices. So im choosing between Za, Fk, Ec series no matter what price. Small to medium size mouses. 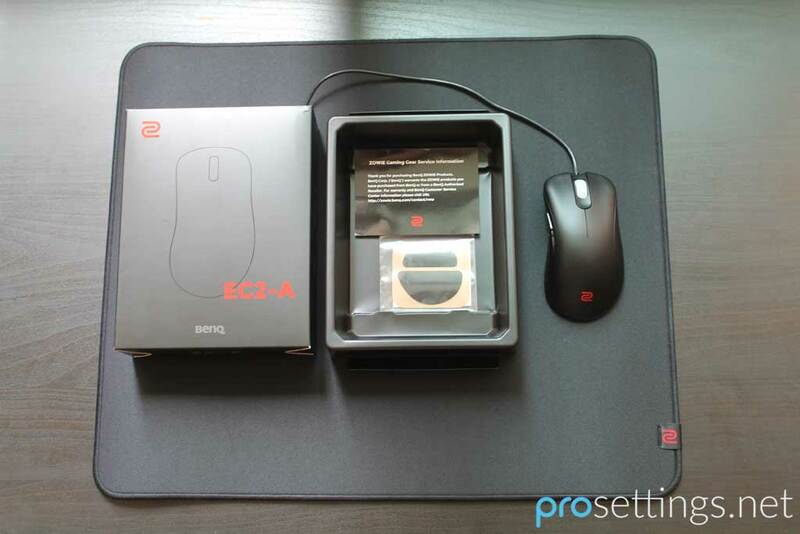 The Zowie EC2-A, EC2-B, FK2 or ZA13 are what you are looking for with your hand size. If you have not had the chance to test any of them I would suggest you going with the Zowie EC2-A or EC2-B since that’s the shape that the most people like. I prefer EC and FK series. used to use rival 300 and razer deathadder with claw grip. should i buy this or fk1? if i have 18.5 cm hands i can play with ec2a with the normal grip ? The EC2-A should suit your hand size just fine I think. It’s a safe shape so it works with most grip sizes if your hand fits the mouse, which should be the case for you. Any suggestion on which zowie mouse should I get? If you’re a claw gripper I’d go for the FK2. The ZA12 has a more pronounced hump towards the back which isn’t really useful for claw grippers, whereas the FK2 has a lower profile which will more easily allow you to claw the mouse. You should get the EC1-A in that case, the dimensions are almost the same as the DA Elite. should I be good with this ec2a/b or should I go for another mouse? The Zowie EC2-A should fit your handsize really well and considering you like the shape it should be a good pickup for you. Hello. My hand size is 16 – 16.5 cm / 9 – 9.5 cm. I am always playing between claw and fingertip grip. Should I buy this mouse or Do you recommend another mouses for FPS games ? Thank you. For that grip style and hand size I’d say the mouse is probably going to be a slight tad too large for you. The FK2 or ZA13 might be a good shout for you, or if you like ergonomic mice you could try out the Roccat Kone Pure Owl Eye. Of course if you can find somewhere to test the EC2-A out in person and it suits you fine then that’s great as well. Each person is different and these size guides etc. are obviously just guidelines. I’ve heard people complaining about their ec2-as getting broken fast, I’m planning to buy it with with my only shot at getting an expensive mouse so I am wondering how often these issues happen and what is the average lifespan of zowie ec2-as? I actually haven’t read an outrageous amount of comments on the durability of the EC2-A. I obviously use a lot of different mice throughout the year (since I have to review them) but some friends of mine have had theirs for years now and haven’t noted any issues. What’s worth noting is that people online are far more likely to comment when something has gone wrong with their product or order as opposed to when everything’s fine. You don’t see many people posting online to say that their products are absolutely fine and still in working order after X amount of time, for example. The average lifespan of the EC2-A isn’t something I can rightfully comment on, as it depends on several factors. If you take care of your mouse (by which I mean you don’t bash it around or pick it up by the cable etc.) it will last you for years. Factory defects are always possible, but that’s when you use your guarantee. As far as price is concerned: a good gaming mouse (with a good sensor) is always going to be costing more than your average office mouse. Getting the best gaming gear isn’t necessarily cheap (especially not once you delve into gaming monitors and PC internals) so there’s always going to be a price hump that you have to get over if you want to buy the best stuff. Hello prosettings can you help me to picking up mouse please? back in 2016 I was using steelseries sensei raw until mid 2018 I had to change it because right click of the mouse kinda broken and sometimes usb disconnect itself. I like the shape of it and comfortable using it both online and LAN. could you help me to choose the mouse? right now I don’t know if I should pick ec2/fk2/fk1. which one of those three have similiar shape+size with steelseries sensei raw? why don’t I just buy another steelseries raw? because I don’t want to install steelseries engine again. The FK line is definitely closer to the shape of the Sensei, much more so than the EC line, so I’d look at that. If you really like that shape I’d certainly recommend a look at the Dream Machines DM1 FPS as well. Hi there, I’m having a hard time choosing between EC1 and EC2. I used to have the Microsoft Intellimouse 3.0 when I first started my gaming career and I really liked it since day 1 although it felt slightly large sometimes. Now I have the Logitech G603 and it just feels heavy and the coating makes it quite slippery although the size feels right. I have 19 X 9.5 cm and I use claw grip. I would go with the EC2-A in that case, that’ll probably feel best if you don’t like larger feeling mice. Is this mouse good for me ??? ?